There are many conventional ways to create a room divider without completely walling off the spaces, like using bookcases and furniture arrangements. Decorative folding screens are an easy, go-to solution and hanging room dividers provides another way to separate spaces. However, these aren't your only options when you need to create separate spaces. 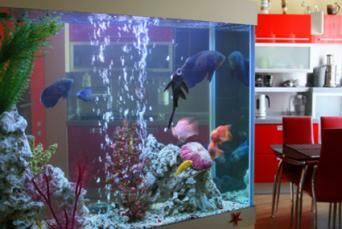 An aquarium can be a great way to divide a large room and create separate spaces. Aquarium Mart offers several styles designed specifically to be used as room dividers. The units are styled in wood frames with molding and provide a view from both sides, so each space can benefit from this amazing room divider choice. One of the easiest ways to divide rooms is to use area rugs to define the spaces. You can use the same rug or select two different ones that go together either in design, color or both. For example, you could select the same patterned rug, but in different colors. If you prefer different patterns, then choose rugs with the same colors. Build a frame using wood in whatever length you need to create the frame. Design the frame to sit directly on the floor or raise it a few inches or even one to two feet above the floor. Create a tripod foot for each end to brace the frame and prevent it from toppling over or purchase premade stylish ones from hardware or woodworking shop. Depending on the frame size, you may need to reinforce the center with a leg to support the size. Attach a sheet of plywood to the frame back. Drill holes in the top part of the frame to insert battery operated light bulbs from a string of lights. Paint or stain the frame. 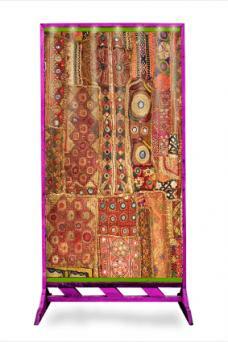 Attach Velcro to the back of each rug or tapestry. Attach Velcro to the plywood on both sides to match the placement of the Velcro on the rugs or tapestries. Another variation of this partition is to only use one rug or tapestry and install wallpaper on the other side of the plywood back, or if you're artistic, create a large painting. Museums use Velcro by hand-stitching it to the top back of the rug and then gluing or stapling the matching strip to the plywood. Depending on the effect you desire, attach Velcro just at the top, the top and bottom, or all four sides. If you're looking for something unique and elegant, a water wall is the best solution for your room divider. You can purchase a customized water wall to use as a room divider. Three boxes will be constructed; one will be smaller to fit inside the bottom box. Glue a pond liner in the smaller box and set it inside the larger one. This is the reservoir for your wall. Attach metal sheeting to the outside of both boxes and plywood to be used for back. Attach the wall's back (plywood). A pump with a lift is necessary and should be able to pump water higher than fountain wall height. A PVC pipe the width of your water wall is necessary. Drill holes every 1/2" to distribute the water. Install LED lights in top box to shine on flowing water. Add river rock or colored craft glass rock in the bottom portion. Acrylic: Acrylic curtains molded right onto the line are available in various lengths up to 30 feet. Bamboo: Choose from either plain bamboo bead or a painted scene curtain. Crystal: A luxe beaded "Cameo" curtain gives sparkle to your divider. 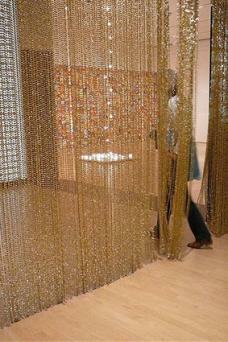 Metal chain: Buy 3' x 6' curtains or order custom size. Mirror: When it comes with bubbles or hoops, this curtain style reflects lots of light. PVC: Cut in circle dics or beaded shapes, these are available in multiple colors. Shell: Choose from genuine or faux capiz shell beads, and they are also available in picture curtain style. String and fabric: Add string curtains with a tieback for an elegant touch, or hang fabric flower curtains. Wood: Select a solid curtain or patterned one. Columns are another way to divide and define spaces. There are several types of columns available that can be easily installed and space apart to create a colonnade effect or an arched area. 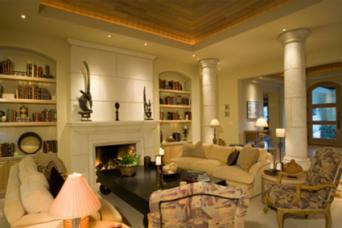 If you may prefer a more dramatic effect go with beaded columns. If you are converting a basement with existing metal columns, consider using a column wrap for a more aesthetic appeal. Build a partial wall out of faux stones. Since most floors can't support the weight of stone you can use conventional foam rocks or faux rock panels. Build a partition out of plywood with a tripod-style support on each end and in the center. Next, attach faux rock panels to the plywood, following manufacturer's instructions. If you're creative, you may wish to create rocks out of polystyrene packaging materials following instructions from YouTube's TheTropicalTaffy. It's best to do this outdoors. Create a basic shape with pieces of polystyrene found in product packaging. Add waterproofer/mortar dye in your desired color to a to sand and cement mix. Mix together until it reaches the right consistency. Use a trowel to place over polystryene. Work until you're happy with the shape. Add texture using stiff brushes, your trowel's edge, and plastic bags. Allow to dry and cure. You can make several rocks and build a wall about five feet in height and cap stained lumber for a shelf to display art objects. Use cement as you would with real rocks to hold your faux rocks together for building a wall. Secure the stained lumber you're using for the cap/shelf with liquid nail applied on the underside of the shelf to adhere to the top of the rock. Spotlight your creation with recessed ceiling lights. You can also create a partial wall or partition effect using megalith-sized faux rocks to create a secluded reading area or dining section. A glass panel or a series of panels make a great room divider without limiting the amount of light in the spaces. 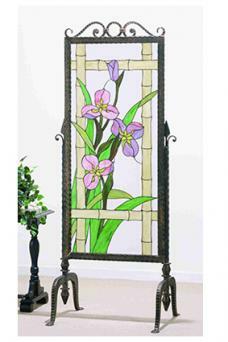 A Tiffany-inspired stained glass partition with a decorative metal frame might be an ideal fit for your décor. If your home style is formal, opt for a Venetian style mirrored glass partition or panel with a gold ornate frame that will reflect your furnishings for a double-effect for rooms. If you don't find the perfect design, you may consider hiring a carpenter and a glass expert or a stained glass artist to create a one-of-a-kind partition designed to fit your taste and style. As you can see, there are many creative ways to divide rooms without the expense of constructing a permanment wall. Whether you decide on one of these dividers or something more extravagant such as LED light curtains or a unique wall divider design from All Modern you can define two separate spaces and achieve an attractive design for your home.